Agroid measures distances, perimeters, areas and position dispersion (metric and imperial units): app designed for a high OUTDOOR visibility (layout, buttons and colors). Using the MARKER FINE REPOSITIONING you can improve the accuracy. Maps can be downloaded in advance in order to avoid any internet connection during a survey (App Google Maps, And.3+). 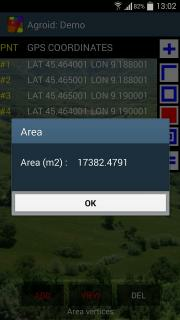 Using the TRACKING mode you can map and measure the area/perimeter by just walking around. 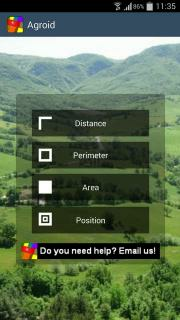 Tablet ready app: it supports Landscape/Portrait mode and pages are automatically resized.